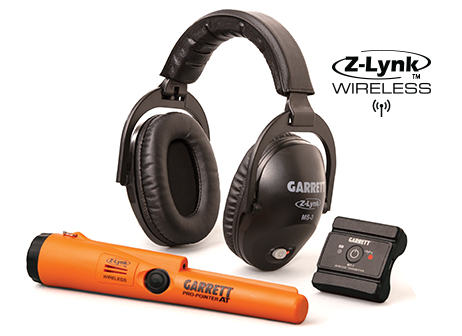 NEW Z-Lynk Wireless Headphone Kit provides easy pairing of MS-3 Z-Lynk Headphones and Pro-Pointer AT Z-Lynk to WT-1 Transmitter. For any style metal detector with 2-pin AT connector or 1/4 inch headphone jack, regardless of brand. MS-3 Z-Lynk Headphones and WT-1 Z-Lynk Transmitter are for land use. Pro-Pointer AT Z-Lynk can be used in water up to 20 feet. Learn more about Pro Pointer AT here. With Z-Lynk, you choose to run silent!